American Idol winner Carrie Underwood spent eleven weeks at the top of the chart in 2006. Hot Country Songs is a chart that ranks the top-performing country music songs in the United States, published by Billboard magazine. In 2006, 23 different songs topped the chart in 52 issues of the magazine, based on weekly airplay data from country music radio stations compiled by Nielsen SoundScan. The number one song at the start of the year was "Must Be Doin' Somethin' Right" by Billy Currington, which had reached number one in the issue of Billboard dated December 31, 2005, and remained at the top until the issue dated January 14 when it was replaced by "She Let Herself Go" by George Strait. This gave Strait his 40th number one, tying the record held by Conway Twitty for the highest number of Hot Country Songs number ones. Strait returned to the top spot in September with "Give It Away" to take the record outright. Nine acts achieved their first number one in 2006. The first was Carrie Underwood, winner of the fourth season of American Idol, who had previously achieved a number-one hit on the Hot 100, but reached the top of the country chart for the first time in January with "Jesus, Take the Wheel", which spent six weeks in the top spot, the longest run of the year at number one. Later in the year Underwood spent a further five weeks at number one with "Before He Cheats", giving her a total of eleven weeks at number one in the year, the most of any act. Other artists to achieve the feat of a debut number one in 2006 included Josh Turner, Jack Ingram, Jason Aldean, Rodney Atkins, The Wreckers, and Heartland. Veteran rock band Bon Jovi scored its first ever country hit and went all the way to number one after releasing a country version of its song "Who Says You Can't Go Home" featuring vocalist Jennifer Nettles. In December, the band Sugarland, of which Nettles is a member, gained its own debut number one with "Want To", which was the final number one of the year. 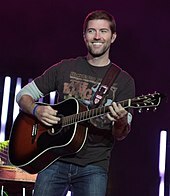 Josh Turner topped the chart for the first time in March. 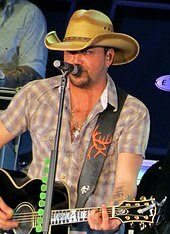 Jason Aldean was another first-time chart-topper. Rodney Atkins got to number one for the first time in August. 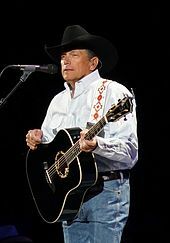 George Strait broke the record for the most Hot Country Songs number ones. ^ "Hot Country Songs chart for December 31, 2005". Billboard. Retrieved 22 August 2010. ^ a b Trust, Gary (April 8, 2009). "Chart Beat: Pink, George Strait, Jamie Foxx". Billboard. Retrieved October 21, 2017. ^ "'Idol' Underwood Shoots Straight To No. 1". Billboard. June 23, 2005. Retrieved October 21, 2017. ^ Thompson, Gayle (January 21, 2018). "12 Years Ago: Carrie Underwood's'Jesus, Take The Wheel' Hits No. 1". The Boot. Townsquare Media. Retrieved October 21, 2017. ^ Leahey, Andrew (March 15, 2016). "10 Great Songs You Didn't Know Chris Stapleton Wrote". Rolling Stone. Retrieved October 21, 2017. ^ Langer, Andy (September 2016). "Jack Out of the Box". Texas Monthly. Retrieved October 21, 2017. ^ Gilbert, Calvin (May 19, 2006). "Jason Aldean's First No. 1 Single Underscores Indie Label's Clout". CMT. Retrieved October 21, 2017. ^ Thompson, Gayle (August 12, 2017). "11 Years Ago: Rodney Atkins Earns His First No. 1 Hit". The Boot. Townsquare Media. Retrieved October 21, 2017. ^ Morris, Edward (September 1, 2006). "The Wreckers' Debut Single Hits No. 1". CMT. Retrieved October 21, 2017. ^ Morris, Edward (November 13, 2006). "Heartland Scores a No. 1 Its First Time Out". CMT. Retrieved October 21, 2017. ^ "Bon Jovi Make History With First Country No. 1". CMT. April 27, 2006. Retrieved October 21, 2017. ^ Gilbert, Calvin (March 1, 2007). "Sugarland Celebrates Platinum Album, First No. 1". CMT. Retrieved October 21, 2017. ^ "Hot Country Songs chart for January 7, 2006". Billboard. Retrieved 22 August 2010. ^ "Hot Country Songs chart for January 14, 2006". Billboard. Retrieved 22 August 2010. ^ "Hot Country Songs chart for January 21, 2006". Billboard. Retrieved 22 August 2010. ^ "Hot Country Songs chart for January 28, 2006". Billboard. Retrieved 22 August 2010. ^ "Hot Country Songs chart for February 4, 2006". Billboard. Retrieved 22 August 2010. ^ "Hot Country Songs chart for February 11, 2006". Billboard. Retrieved 22 August 2010. ^ "Hot Country Songs chart for February 18, 2006". Billboard. Retrieved 22 August 2010. ^ "Hot Country Songs chart for February 25, 2006". Billboard. Retrieved 22 August 2010. ^ "Hot Country Songs chart for March 4, 2006". Billboard. Retrieved 22 August 2010. ^ "Hot Country Songs chart for March 11, 2006". Billboard. Retrieved 22 August 2010. ^ "Hot Country Songs chart for March 18, 2006". Billboard. Retrieved 22 August 2010. ^ "Hot Country Songs chart for March 25, 2006". Billboard. Retrieved 22 August 2010. ^ "Hot Country Songs chart for April 1, 2006". Billboard. Retrieved 22 August 2010. ^ "Hot Country Songs chart for April 8, 2006". Billboard. Retrieved 22 August 2010. ^ "Hot Country Songs chart for April 15, 2006". Billboard. Retrieved 22 August 2010. ^ "Hot Country Songs chart for April 22, 2006". Billboard. Retrieved 22 August 2010. ^ "Hot Country Songs chart for April 29, 2006". Billboard. Retrieved 22 August 2010. ^ "Hot Country Songs chart for May 6, 2006". Billboard. Retrieved 22 August 2010. ^ "Hot Country Songs chart for May 13, 2006". Billboard. Retrieved 22 August 2010. ^ "Hot Country Songs chart for May 20, 2006". Billboard. Retrieved 22 August 2010. ^ "Hot Country Songs chart for May 27, 2006". Billboard. Retrieved 22 August 2010. ^ "Hot Country Songs chart for June 3, 2006". Billboard. Retrieved 22 August 2010. ^ "Hot Country Songs chart for June 10, 2006". Billboard. Retrieved 22 August 2010. ^ "Hot Country Songs chart for June 17, 2006". Billboard. Retrieved 22 August 2010. ^ "Hot Country Songs chart for June 24, 2006". Billboard. Retrieved 22 August 2010. ^ "Hot Country Songs chart for July 1, 2006". Billboard. Retrieved 22 August 2010. ^ "Hot Country Songs chart for July 8, 2006". Billboard. Retrieved 22 August 2010. ^ "Hot Country Songs chart for July 15, 2006". Billboard. Retrieved 22 August 2010. ^ "Hot Country Songs chart for July 22, 2006". Billboard. Retrieved 22 August 2010. ^ "Hot Country Songs chart for July 29, 2006". Billboard. Retrieved 22 August 2010. ^ "Hot Country Songs chart for August 5, 2006". Billboard. Retrieved 22 August 2010. ^ "Hot Country Songs chart for August 12, 2006". Billboard. Retrieved 22 August 2010. ^ "Hot Country Songs chart for August 19, 2006". Billboard. Retrieved 22 August 2010. ^ "Hot Country Songs chart for August 26, 2006". Billboard. Retrieved 22 August 2010. ^ "Hot Country Songs chart for September 2, 2006". Billboard. Retrieved 22 August 2010. ^ "Hot Country Songs chart for September 9, 2006". Billboard. Retrieved 22 August 2010. ^ "Hot Country Songs chart for September 16, 2006". Billboard. Retrieved 22 August 2010. ^ "Hot Country Songs chart for September 23, 2006". Billboard. Retrieved 22 August 2010. ^ "Hot Country Songs chart for September 30, 2006". Billboard. Retrieved 22 August 2010. ^ "Hot Country Songs chart for October 7, 2006". Billboard. Retrieved 22 August 2010. ^ "Hot Country Songs chart for October 14, 2006". Billboard. Retrieved 22 August 2010. ^ "Hot Country Songs chart for October 21, 2006". Billboard. Retrieved 22 August 2010. ^ "Hot Country Songs chart for October 28, 2006". Billboard. Retrieved 22 August 2010. ^ "Hot Country Songs chart for November 4, 2006". Billboard. Retrieved 22 August 2010. ^ "Hot Country Songs chart for November 11, 2006". Billboard. Retrieved 22 August 2010. ^ "Hot Country Songs chart for November 18, 2006". Billboard. Retrieved 22 August 2010. ^ "Hot Country Songs chart for November 25, 2006". Billboard. Retrieved 22 August 2010. ^ "Hot Country Songs chart for December 2, 2006". Billboard. Retrieved 22 August 2010. ^ "Hot Country Songs chart for December 9, 2006". Billboard. Retrieved 22 August 2010. ^ "Hot Country Songs chart for December 16, 2006". Billboard. Retrieved 22 August 2010. ^ "Hot Country Songs chart for December 23, 2006". Billboard. Retrieved 22 August 2010. ^ "Hot Country Songs chart for December 30, 2006". Billboard. Retrieved 22 August 2010. This page was last edited on 21 February 2018, at 23:33 (UTC).